1 bed self contained apartment for 2 people. In a quiet village in North Creuse. 1 Bedroom, 1 Bathroom, for 2 people. One bedroom Apartment situated by itself above an English tea room. Double bedroom with king size bed. All bed linen and towels included. Open plan kitchen/lounge area. Kitchen is fully equipped, includes microwave, iron, ironing board, cutlery, crockery, saucepans etc. Lounge has free view English or French TV and WiFi included. Bathroom has a washing machine and shower cubicle only (no bath) There is access to the rear garden round the side of the building. A barbecue and table and chairs for the garden are available. Set in a small quiet village in North Creuse. Ideal for cyclists and walkers. Close to the 3 lakes. All with man made beaches and little cafes on site. Very peaceful and beautiful scenery. The pretty village of Boussac is 20 kilometres away, which has a market on a Thursday in the main square. There is also a chateau in Boussac that is open to the public and do guided tours. The apartment is in a quiet rural location. There is a Medieval costume museum, that has over 3000 costumes, about a kilometre and a half away. There is a swimming lake about 20 minutes drive away at Chatelus Malveleix. The local supermarkets are in Boussac or La Chatre which are approximately 15 minutes drive away to both, but in different directions. Price includes heating through the winter months. Quiet peaceful location. ideal for walkers and cyclists. Also ideal if you just want a quiet few days away. Shower, toilet, sink and washing machine. Radiators provided in winter months (December, January and February). After these months radiators can be provided at cost. 8kw of electric allowed per day. Mor than 8kw will be charged from deposit. A good selection of books can be borrowed from the tea room next door. Golf club 15 minutes drive away. Stairs leading up to apartment. The property was well equipped with all the appliances we needed ,even a washing machine. The decor was modern and tasteful and finished to a good standard .It was ideal for a quiet relaxing break but there were local markets and larger towns within reasonable driving distance. This was exactly the sort of short break we were hoping for. Apartment was well equipped and comfortably furnished.Suited our needs perfectly. Directions to find were well given and contact was kept up to date as required. Would recommend and use again.Thanks for a great stay. Great Base for viewing properties. We are glad you both enjoyed your stay. Thank you for your kind words. Please let us know of any improvements we could make to get a possible five star review the next time you visit. Good luck with the house hunting and we hope to see you soon. Take care. We loved the apartment and the locality. Had some lovely walks and plenty of places to visit . 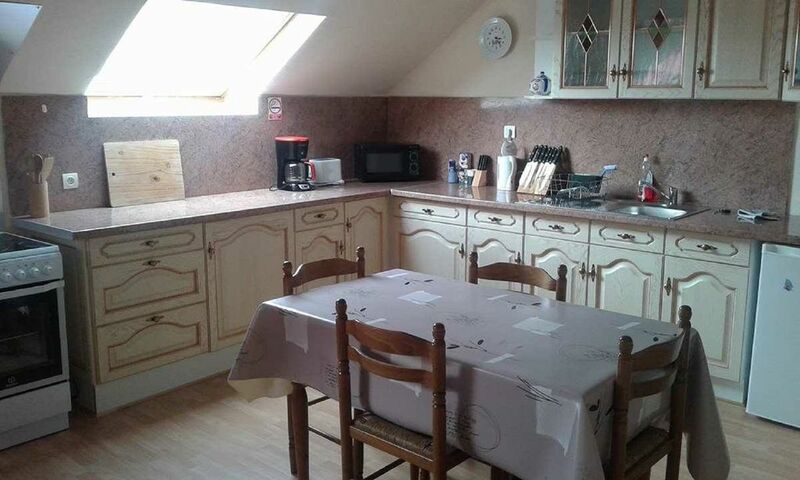 A very cosy apartment, an ideal base to tour Creuse. We were made very welcome and it was lovely to meet English owners. Cooked breakfast and fish and chips were excellent. Apartment very peaceful. All mod cons provided. We stayed for a week while property hunting. The location was ideal for our trips out each day. Both Michelle and Emma were wonderful hosts providing us with a cooked breakfast on the mornings we wanted and also lots of advice and tips on buying in France. The apartment was clean and well equipped for our needs. A very quite location which was just what we were after. We would not hesitate in recommending the apartment to any one else.